The spirit of Baal continues to operate on the earth today. It has taken on slightly different manifestations, but remains consistent with the attributes I taught in the previous post. It may be called different names within the Christian community, e.g. Jezebel spirit, anti-Christ spirit, etc, but it exists and functions today. In contrast to this demonic spirit, the Spirit of Truth is Jesus Christ, the author and finisher of our faith, the Son of God, and the source of all victory over the spirit of Baal. First, it always brings death and destruction. That, of course, can be said of Satan in general, he came to ‘destroy’ (John 10:10). But the spirit of Baal will operate through an entire culture to bring destruction. In ancient times it included child sacrifice (2 Kings 17:16,17; Jer. 19:5; 32:35). In America it operates through satanic cults and the language of death and destruction in contemporary music. Music is a conduit for the demonic to affect the listener by bringing thoughts of suicide, murder, violence in forms of rap and other contemporary music. In some cultures, there are abnormal violent outbursts that I attribute to this demonic influence. 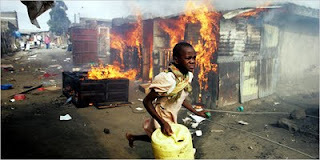 For example, in early 2008 normally mild mannered, friendly people of Kenya experienced great internal violence, death and destruction between tribal groups over disputed election results. Men who had greeted each other in church one week suddenly sought to kill each other the next week. Villages who tolerated people of different tribes suddenly beat and murdered those same people. This year I personally saw the results of this violence in Nakuru, Kenya where buildings had been burned and ransacked during that violence. The spirit of Baal took advantage of the unrest and operated through willing participants. Click here to be taken to the next post in The Spirit of Baal Series, where we will take a necessary pause in examining the characteristics to discuss the Way to combat it.